DDA builds online credibility with exceptional website design. When your business is the installation of beautiful building materials, such as shower doors, closet organizers, and bath accessories, your website should serve as a calling card, effectively showcasing your portfolio of work, while clearly outlining your company’s service offerings. While L&R Installations, Inc., a major supplier and installer of luxury building materials, had secured a place for itself within the search engine standings, its website lacked style and substance. 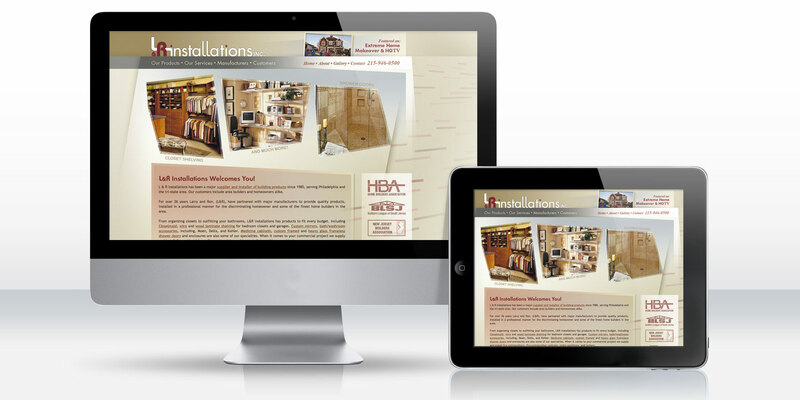 To help these key aspects of web design, DDA offered its expertise and assistance during the redesign and redevelopment of www.lrinstallations.com. Through the creation of a modern, eye-catching design, the expansion of site contents, and the implementation of a photo gallery of completed works, DDA sought to build online credibility for this Philadelphia-based company. By highlighting L&R Installation’s affiliation with reputable building authorities, notable projects, and areas of expertise, DDA would showcase the company’s strengths, effectively detailing why L&R is the best choice for quality kitchen, bathroom, and closet installations. Working closely with the client, DDA’s staff of graphic designers created an unforgettable website design that draws its inspiration from clean architectural lines. A rotating banner cycles through impressive images of L&R Installation work, encompassing the company’s central focus of shower door installation, closet shelving system configuration, mirror installations, and much more. Site visitors can appreciate the company’s portfolio of work by browsing the site’s photo gallery, while well-organized pages of content discussing L&R Installation’s product selection, service offering, and manufacturer affiliations clearly define the company’s purpose and breadth of capability. Launched in 2011, the redesigned L&R Installations website transformed a once substandard web presence into a powerful and professional online destination, finally matching the company’s reputation of excellence with an equally impressive website design and structure.